This October marks 20 years of uninterrupted work by the National Indigenous Congress [CNI], a space of unity, reflection, and organization for the indigenous peoples of Mexico. The National Indigenous Congress has worked for the full reconstitution of our peoples and the construction of a society where all cultures, all colors, and all of the peoples of Mexico fit. 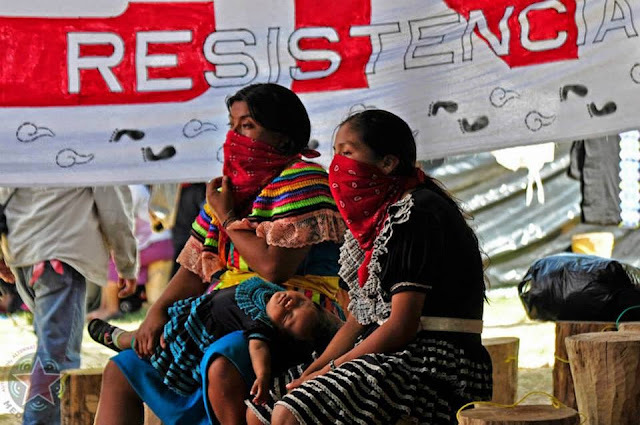 Throughout these years, and with increased strength since the release of the Sixth Declaration of the Lacandón Jungle by the Zapatista Army for National Liberation, we have forged in word and action our contributions to the struggles of resistance and rebellion throughout the national geography. We not only sustain our decision to continue our existence, but we honor this decision with all our strength and with our fists in the air. We honor it by weaving together profound and collective agreements that can be seen in our care of the earth, in our languages, in our traditions, and in our collective governments in their many different names and forms. The flame of our autonomy lives inside these things, and it illuminates the collective heart of our peoples, barrios, nations, and tribes. These are deep agreements that we work on every day so that each one gives rise to the complex territories that together constitute our autonomy and self-determination. While we weave life, capitalism designs and lays out over us its own territories of death in every corner of our suffering Mexico. Supposed mining territories, cartel activity by organized crime, agroindustry, political party territories, urban zoning rights, and conservation programs are all imposed on our lands and in none of them—no matter what name they are given by the system or its obedient governments—do the indigenous peoples fit. The capitalists began and continue to expand a bloody war of conquest to take over what has always been ours. They appear behind any number of masks in this constant war of extermination: the businessman, the politician, the police, the soldier, or the hitman. And as always, the dead, the disappeared, and the imprisoned come from us, as well as the stolen and destroyed lands. Any collective, autonomous, and rebellious hope is persecuted. We have resisted this capitalist onslaught against our peoples. From the devastation wrought on us we have dreamed and built new worlds. From our grief and mourning for our murdered compañeros we as peoples have recreated new forms of resistance and rebellion that allow us to halt this devastation and walk the only path possible for those below and to the left: to construct and exercise the justice denied us by the powerful who purport to govern us. It is urgent that we bring our flames of resistance, autonomy, and rebellion together. These flames illuminate every originary people who weave new worlds that are truly from below, where love and the ancestral commitment to our mother—the earth—are born. Arrival at CIDECI and registration for the authorities, representatives, indigenous delegates, press, and invited guests of the CNI Coordinating Commission. Members of the National and International Sixth who want to participate as observers in the sessions of the Fifth CNI should register ahead of time at the email: cni20aniversario@ezln.org.mx. The Fifth National Indigenous Congress will have both public sessions (the inauguration and closing) and closed ones. Media that registers with and is approved by the CNI Coordinating Commission will be allowed to cover only the CNI’s public sessions. Media registration will be held October 9 and 10 at the site of the Congress.